I’m a proponent of the strict reading of the Moldvay rules when it comes to spells: not being able to learn more spells than you can cast per day. Also, not being able to copy spells from scrolls and spellbooks and requiring a teacher instead, no spell research and no crafting of magic items. 2013-02-16 Spell Book Notation: “I used to just write down the master spell book. That slows me down when figuring out which spells lower level casters know.” Actually, I don’t use this anymore. 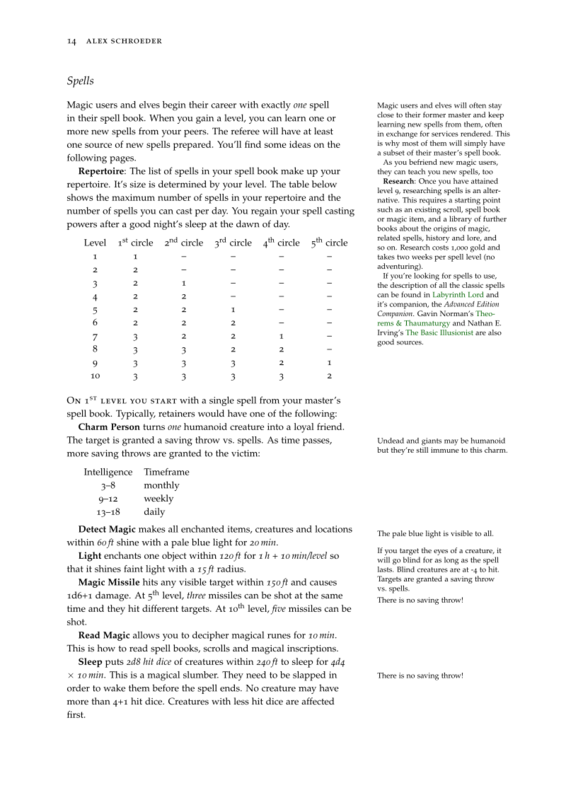 Spellcasters: “This book lists important spellcasters which can act as quest givers and teachers for player characters.” There’s also a separate PDF for every caster in the same directory. Note that I recently edited my PDF and so what used to be page 15 is now page 14 and that’s why this episode and the last episode both talk about page 14. This page would have been page 15 not so long ago.